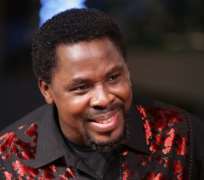 On Sunday 30th May, TB Joshua spoke prophetically concerning the flag of a country, stating: “There is rain and the flag is outside, and I see the rain fall on the flag…” Weeks later on Sunday 14th June, he reiterated: “Remember a flag of a country that I told you I saw outside and the rain was falling. Pray and pray. What will make the flag to be the one to cover the coffin? This is what I am seeing.” Piecing the puzzle slowly together, the following month on Sunday 12th July he mentioned the flag a third time, this time stating he sees 'the flag was brought down' and repeating a call for prayer. The final revelation was the following week on Sunday 19th July where he said the 'flag that is being pulled down' was 'in the middle', proceeding to say this was his last word on the flagging issue. Months later on the night of Tuesday 25th August 2009, US Senator Edward Kennedy, recognised as one of the most influential senators in history, died following a yearlong battle with brain cancer. The death of Senator Kennedy touched the entire nation of the USA , a grief-stricken Barack Obama issuing a presidential proclamation that US flags around the world fly at half mast in honour of the celebrated Senator. On Thursday 27th August, 2009, the coffin of Senator Kennedy draped in the American flag was escorted through the streets of Boston where it finally halted at the John F. Kennedy Presidential Library. Throughout Thursday and Friday, an approximate 45,000 people filed past the Democratic legend's flag-draped coffin, paying their final respects for his life and legacy. Amidst heavy rain, thousands lined the streets of Boston on Saturday morning as the coffin was escorted to the Basilica where the funeral took place, the rain falling on the coffin in the course of the procession necessitating a plastic covering. A military honour guard carried the flag-draped coffin into the church as the steady rain fell. With yet another prophetic fulfilment, the constancy of TB Joshua's predictions remain a source of surprise and acclaim within African religious circles, people progressively taking more heed of the prophet's words and tuning into his live service on Emmanuel TV to hear the opinion of God.